The launch of the small-platform models brings the company's loader lineup to 17 machines. JCB is populating its small-platform loader lineup with a range of new models in a move that it says gives it 97% market coverage. The new launch includes eight new machines, five skid-steers and three track loaders, to complement the JCB large platform New Generation models launched in late 2010. Newcomers include the 135, 155, 175, 190 and 205 skid-steers, and the 150T, 190T and 205T compact track loaders. The 135 skid-steer from JCB is the smallest of the company's new offerings, which bring JCB's loader lineup to 17 models. The 135, 155 and 150T machines feature radial lift, which offers improved digging geometry for heavy loading applications. The design uses fewer pins and bushings and is well suited for high-cycle applications. The 175, 190, 205, 190T and 205T models offer vertical lift, which provides maximum reach at full height -- important for loading, lifting and drilling with an auger. The new designs feature 38% fewer parts and 25% fewer leak paths than many competitors, making hydraulic leaks almost non-existent. All of the new models are available with the optional hydraulic quick-hitch that allows operators to change out attachments in the field 33% faster than traditional methods. And, those attachments come in 31 families of choices. Operator comfort and safety is another design feature in the new models, with 270-degree visibility, a side door that prevents the operator from having to crawl over attachments and tools, and a cab that is 46% larger than competitors. Service features include electro hydraulic servo controls to minimize leak potential, a large opening rear door with a tilting cooling pack for easy access, and a tilting cab to offer unrestricted access to the powertrain and "more detailed" service points. JCB's new 190T small-platform track loader is one of eight new machines launched by the company this year. 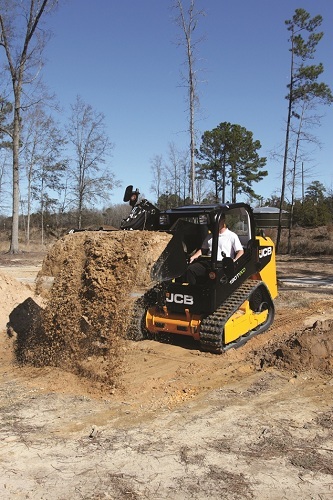 For more information on the new JCB small-platform machines, visit www.jcbna.com, or call (912) 447-2000.